States tend to feel secure by defending their territories. On the other hand, environmental concerns know no boundary and need no less attention than border security. The long-term goal of the historic Paris climate agreement of December 2015 – to keep global temperatures “well below 2 degrees Celsius above pre-industrial levels and to pursue efforts to limit the temperature increase even further to 1.5 degrees” was agreed upon by the member-states, notwithstanding the later US withdrawal from the agreement. Developing countries such as India were able to turn the tables to their advantage when the agreement recognized the “common but differentiated principle” – developing and developed countries have different levels of obligations and responsibilities for reducing greenhouse-gas emissions. While it was recognized that developing countries cannot bear an obligation significantly to reduce the use of coal considering their rising energy demands and industrialization process, New Delhi made voluntary commitments to increase the use of clean energy and clean technology. The US withdrawal from the Paris agreement carried the potential to impinge on the willingness of the developing countries, including India, to curb carbon emissions, as they would not only be deprived of much-needed financial and technological assistance from the US, they could console themselves under the American fig leaf even if they were lax on environmental issues. In view of the immediacy of the threats from climate change and rising levels of pollution, however, India can ill afford to wait for external assistance and make excuses for shrugging off its responsibility to curb emissions. The report is crucial also in its reference to the damage already done to the climate when it asserts that human activities have already caused approximately 1 degree Celsius of global warming above pre-industrial levels and projects it to reach 1.5 degrees between 2030 and 2052 if the trend continues. The implications of a rise of 1.5 degrees above pre-industrial times would be catastrophic, particularly for countries such as India with high densities of population and economic activities and where a major chunk of the population depends on natural resources for their livelihoods. There is a high degree of social inequality and poverty in India too, which would be exacerbated by climate change, and therefore a rise in temperature would have adverse social implications. India, primarily an agrarian economy with a high dependence on rainfall, is anticipated to wade through difficult times even with a minor rise in global temperature, and furthermore there would be significant pressures on India’s water, air, soil, and forest resources. It is worth mentioning that many people making their livelihoods from agriculture and fishery are susceptible to rises in sea levels and frequent occurrences of droughts and floods. This apart, India has been witnessing a steady rise in humidity levels as well as occurrences of people dying from sunstroke, and could see regular deadly heatwaves if the climate is allowed to deteriorate further. Indian Environment Minister Harsh Vardhan is reported to have responded to the findings of the report by stating that New Delhi already recognized the threat posed by climate change and was making all efforts to combat global warming. However, restricting the rise of temperature even to 1.5 degrees Celsius will be an uphill task that will require rapid, far-reaching and unprecedented changes in all aspects of society, according to the report. India is projected as one of the few countries to encounter massive economic losses from climate change. It is significant to underline that the US, India and Saudi Arabia, are projected to be the top three counties to bear the most losses from climate change. It is also worth recalling that just two years prior to the Paris agreement, 44% of India’s energy basket was constituted by coal, and renewables accounted for only 3%, according to a report from the US government’s Energy Information Administration. While Indian Prime Minister Narendra Modi, prior to ratifying the Paris agreement, pledged to supply electricity to 18,000 energy-poor villages by 2019 through a mix of fossil fuels and renewable sources, solar energy is likely to supply power to around 15% of the villages and about 85% would come from the central grid, which is still mostly fueled by coal, argues Debajit Palit, an associate director at The Energy and Resources Institute (TERI), a non-governmental organization specializing in development of renewable energy in India. Several scholars have attributed the Kerala floods of 2018, floods in northern India, including flash flooding at Kedarnath, Uttarakhand, which took a huge toll on human lives in 2013 and floods in northern Bihar and in Chennai, in the southern part of India to human-induced factors such as climate change and the destruction of the local ecology. As the Indian economy keeps on urbanizing and transitioning toward swift transportation of human beings as well as goods, reliance on hydrocarbons-propelled vehicles has increased and switching over to renewable energies has not been a success. Promotion of electric vehicles and solar power for electricity generation has not encouraged people to reduce their dependence on hydrocarbons. 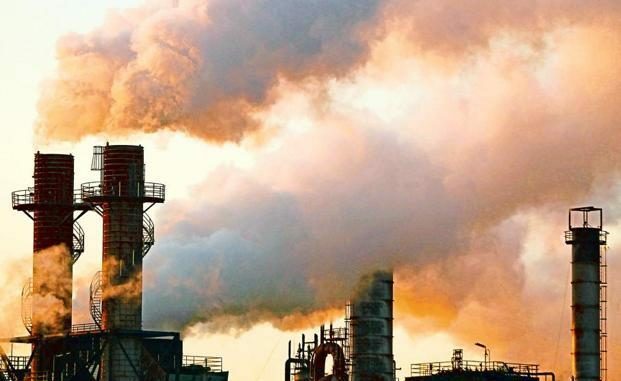 According to the findings of the Central Pollution Control Board (CPCB), many cities across India – 11 in the state of Uttar Pradesh alone – are seriously affected by rising levels of air pollution. However, pollution in Delhi has become a major concern, and the air quality of the city was reduced drastically after Diwali, the Indian Festival of Lights on November 7. Ignoring emanating threats from rising pollution levels, residents of the city celebrated with fireworks, lamps, firecrackers, and bottle rockets and the city witnessed an alarming level of pollution notwithstanding measures such as the extension of the ban on the entry of trucks, construction and polluting industries. As most of India’s population lives in rural areas, air pollution in those parts of the country cannot be ignored, and pollution cannot be ascribed to traffic exhaust, factory emissions, and construction dust alone. A large chunk of households in rural India depends on biomass like wood and dung for cooking and other purposes, and agricultural practices such as burning crops are also rampant. According to a recent World Health Organization report, use of stoves, wood or dung for cooking results in indoor pollution, which causes asthma and infections such as tuberculosis among children and mothers in India are more likely to deliver underweight babies in rural households. However, pollution generated in rural and urban areas has been accumulating to precipitate a climatic crisis in India. Underlining the importance of this issue, the Supreme Court of India has broadly interpreted the right to life under Article 21 of the constitution to include the right to a healthy environment. To this effect, it has emphasized the need to set up specialized environment courts for the effective and expeditious disposal of cases involving environmental issues. Concerns are also regularly expressed by government institutions as well as civil-society groups on the need to stem the crisis. However, there are plentiful instances of socio-economic and political practices which are practiced as norms, irrespective of environmental concerns. The Indian industrial sector seems prone to practices and technology that would enable it to produce more goods and incur higher profits rather than maintaining eco-friendly standards. Politicians are usually rallied by party supporters during public meetings and functions with motorcycles and other vehicles causing pollution. Further, the Indian masses in a globalizing economy not only aspire for larger and higher quality goods. For instance, an individual may aspire to have more garments, accessories and ornaments while he or she already has enough of these items. Several online shopping sites, through their better presentation skills, can engender greed in the guise of better quality and style and attract through lucrative offers. This stimulates further industrialization to produce goods for every need. It is clear that this rise of consumerism has an environmental cost. While there is a dire need of awareness among the masses in rural areas about environmental concerns, people in urban areas also need to practice environment-friendly lifestyles. The Indian government, with cooperation from civil-society groups, must turn the rapid urbanization into an environmentally friendly exercise through energy-efficient buildings and mass transportation systems. There is need for a change in personal traits as demands at the individual level will compel and induce the state to act. While international cooperation is crucial to ensure that the world reaches the emission targets of the Paris agreement, it is time that New Delhi swiftly coordinates its efforts, as well as those of civil-society groups and individuals, in considering the significance of the IPCC report.